'Can You Feel The Beat' is undoubtedly the shining star on this release. An electro / techno / acid crossover. Quite pacy with its wigged out 303 producing intense, undulating fervour. Well before its time. It's like Detroit-UK-Chicago-NYC-LA-Miami and 'Kraftwerk' all mixed into one compressed package. What a rush. All about the (Instru"MENTAL" Dub Mix). Essential warehouse tunage this. Still Life Keeps Moving Club mix starts with that great Detroit style synth riff and then drops a tough kick followed by the vocal and bass-line, strings and a nice little beep riff that drops in and out through the mix. Released before the Network version this is slightly less energetic and more Detroit sounding in its overall style as it plays on those elements a little more throughout the track and relies less on the rap making it I really nice house track with a really great vibe to it, making this a bit of a classic. The other mixes are pretty decent too, with the instrumental being self explanatory Instru “Mental” Dud having more of a prominent breaks loop and acid riff creating quiet a different feel to the club mix. Worth taking a few minutes to listen to this one. 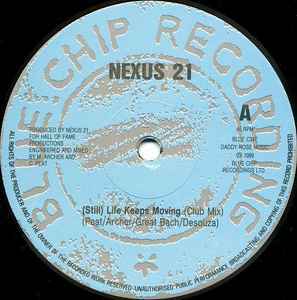 The remix on Blue Chip C34R is fairly similar just playing on slightly different elements, plus a couple of extra tracks and is worth a listen too. Starting off with - Still Life Keeps Moving (the remix), which has an added 303 towards the second part of the track. Nice moody vocals, a catchy Kevin Saunderson (Inner City) style funky keyboard riff and pounding kik drum a la Detroit Techno House. A 1989 classic for all those who know. Switch to side B and you've got Lisa Lisa & Cult Jam's vocal sample "Can You Feel The Beat" over some busy, tough freestyle/electro rhythm, and wobbly, squiggly, turbulent acid undulating throughout. Great track. Second track on side B is Bass Inclusion which is more minimal than the rest, but makes up for it with it's bassline, appreciated more so when played LOUD! Very apt name indeed. Three gems on one EP.